As fall rolls in, my wardrobe plan begins to change. It’s cool in the morning and hot by 3 p.m. So out come the sweaters and jackets. I had an opportunity to celebrate my birthday with some fabulous friends this weekend. Saturday we met at one of my favorite restaurants Seasons 52. It’s one of those places that sources their produce locally and changes their menu four times a year along with the seasons. They were debuting their Fall menu this past weekend so it was a perfect timing for this birthday girl. 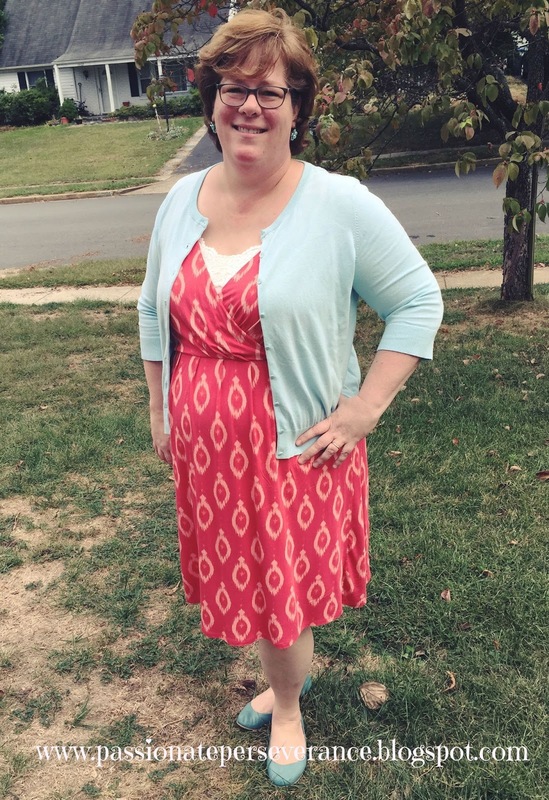 I wore a comfy empire waist cotton dress layered with a lace camisole for modesty. I paired it with an ice blue sweater and robins egg blue flats. I like the color combo. It makes me think of summer meeting fall. This morning it was also a cool morning. Today is one of our shorter marathon Sundays at church with only CCD and Mass. Many of our teens are up in Philly hanging out with Pope Francis. Lucky them. Because of that, there is no Youth Ministry tonight which means early bedtime for me. 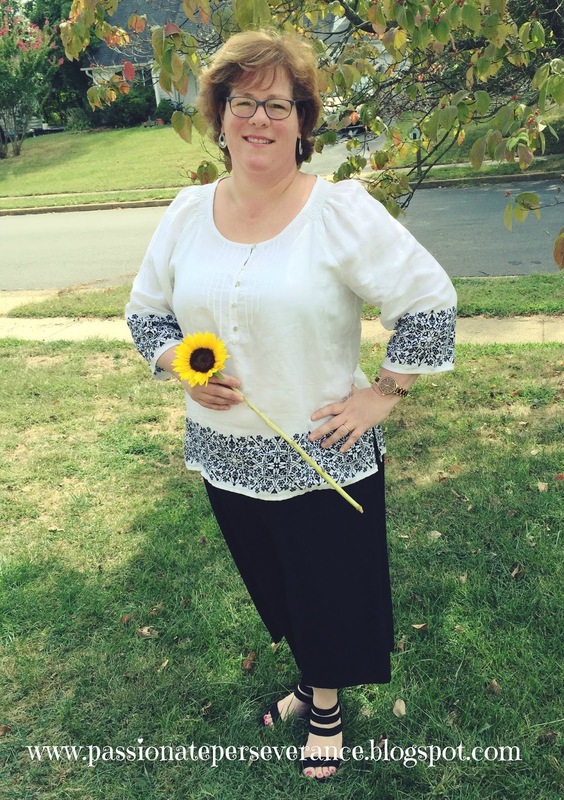 I wore a pair of knit black gauchos and a white linen peasant blouse with black flower details at the hems of the sleeves and bottom. It’s heavy enough to not require a sweater but light enough to handle my hot flashes like a champ. 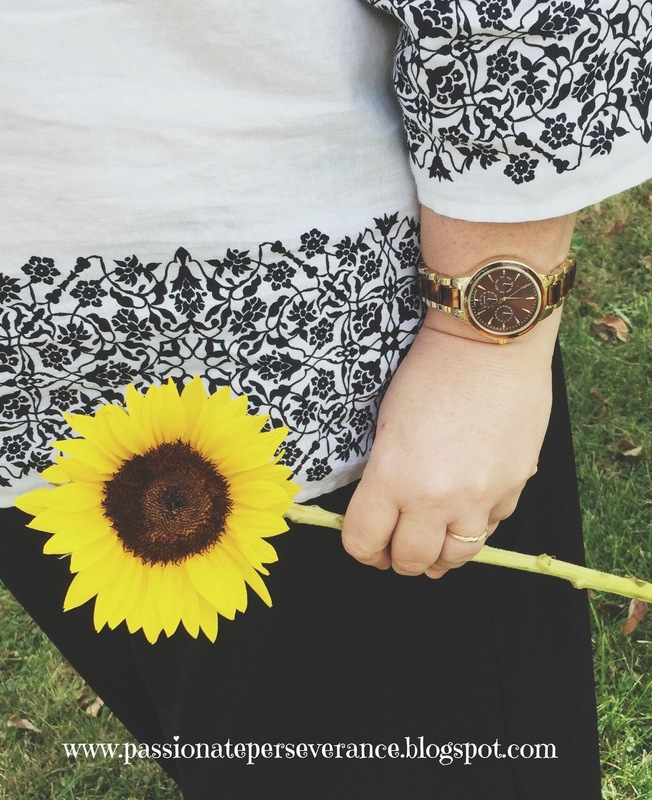 I also got to show off my new watch from Michael Kors, a very generous birthday gift from a sweet friend. You can see it in the photo above. I love it’s two-tone wonderfulness. I look forward to wearing it a lot. I also wore a pair of heels (ish) since we are only at church for four hours instead of seven. I felt comfy and stylish. Thanks so much for all the birthday wishes. It’s been a lovely weekend and I have felt so loved and cared for. My hubby and son are just the best, then you add in my very close friends and well…it’s been awesome. I like the addition of Robins Egg Blue. I'll have to try that combo. Thanks for the inspiration. You are soooo beautiful! And thanks for your incredible Fountains of Carrots interview. As for Courtney… Santo Subito!!! I love your choices, especially the black and white outfit! Love those kind of dresses–they make me happy! And the color combination is fabulous!